Welcome to one of our smallest but sweetest properties! 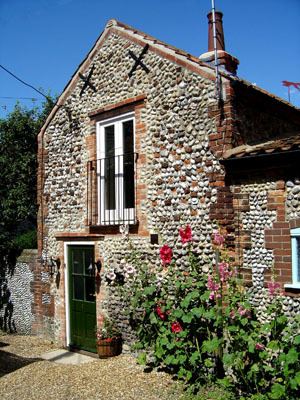 Converted from a grade II listed coach house the property has everything a couple could need to use as a base for exploring the lovely North Norfolk Coast. The charming owners have put a lot of thought into making the most of the space on offer and have fitted a lovely quality galley kitchen into the ground floor entrance hall with electric oven and halogen hob, fridge and dishwasher and an excellent selection of crockery and cooking equipment. The spiral staircase leads up into the cosy sitting room with a lovely linen 2 seater sofa, fold out dining table and chairs and for quiet evenings in, an LCD TV and Dvd are provided. The little room is flooded with light from the french doors with “juliet balcony” and the high ceiling adds to this. The cottage has full central heating making it cosy for stays whatever the season! The double bedroom is a good size with its comfy 5′ bed and again is wonderfully light and airy thanks to the two velux windows installed. This room leads to the en suite bathroom, cleverly fitted into the old hayloft. The owners have made the very best of the space with a stylish bathroom suite and ceramic tiled floor, including a fitted washbasin, wc and bath. There is a shower within the bath but as there is restricted headroom this is not at full height. Converting listed buildings is never easy but every inch of the space here is put to good use and the result is a lovely bolt hole for two, set down a little loke in the heart of Blakeney. The quay, pubs, restaurants and shops are just a stroll away. Phone now for more details of this charming restored Hayloft!